Today marks the 70th anniversary of the largest amphibious landing in all of military history. Most of the photos and film captured on that pivotal day were in black and white — but a precious few were shot in color. Here's D-Day as you've never seen it before. Remarkably, the only known Allied color footage of World War Two's Western theatre was uncovered in the attic of Hollywood film director George Stevens. It sat there until it was discovered by his son, George Stevens Jr., back in the 1990s, and subsequently released in the 1994 documentary, D-Day to Berlin. 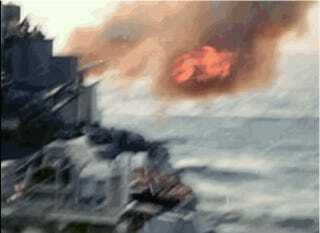 "We thought at the time that this was the only colour film of the war in Europe. As it turned out, there was some German film that had not yet been discovered," Stevens Jr. told the Telegraph. "But it is the greatest body of colour film, and World War II was a black-and-white war. That's how we see it. That's how we saw it. And suddenly to see it in colour, it just took on a whole other dimension." You can watch the entire 44-minute film here, but I've put together some screenshots. These are some of the first American soldiers to attack the German defences in Higgins Boats (LCVPs). They're seen here approaching Omaha Beach. Plastic covers protect the soldier's weapons from the water. Once at the beach, many soldiers, terrified of exiting through the front, flung themselves over the sides into the deep water where, owing to the weight of their equipment, they sank to the bottom and drowned. (Photo by Robert F. Sargent, U.S. Coast Guard/Galerie Bilderwelt/Getty Images). These are just a sampling, many more here. Though not in color, these aerial shots of D-Day provide another rare glimpse of the invasion. The original press release caption to these images read: "Men and assault vehicles storm the beaches of Normandy as allied landing craft make a dent in German's west wall on 6 June 1944. 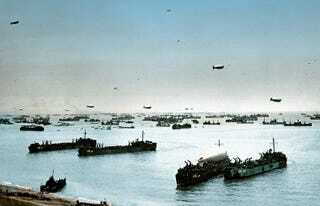 As wave after wave of landing craft unload their cargo, men move forward and vehicles surge up the roads. Note the men swarming over the beaches."